•	Over a third of British families (36 per cent) have been stranded on holiday without access to a suitable child car seat. 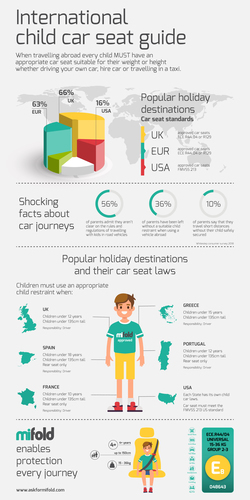 •	17 per cent of parents have allowed their child to travel in a car on holiday, without being suitably secured. •	56 per cent of parents are not clear on the rules and regulations of travelling with kids in road vehicles in the UK. •	Handy infographic created to support parents travelling at home and abroad. New research has found that over a third (36 per cent) of parents have been left without a suitable child restraint when using a vehicle abroad. The research, by mifold and conducted with road safety charity BRAKE, raises serious questions about children’s car safety being compromised, with 17 per cent of parents allowing their child to travel in a car on holiday, in the UK or abroad, without being suitably secured. Worryingly, the survey of 2,000 parents, found that 56 per cent of parents admit they are not clear on the rules and regulations of travelling with kids in road vehicles in the UK. This figure is likely to be higher when it comes to European and international laws. 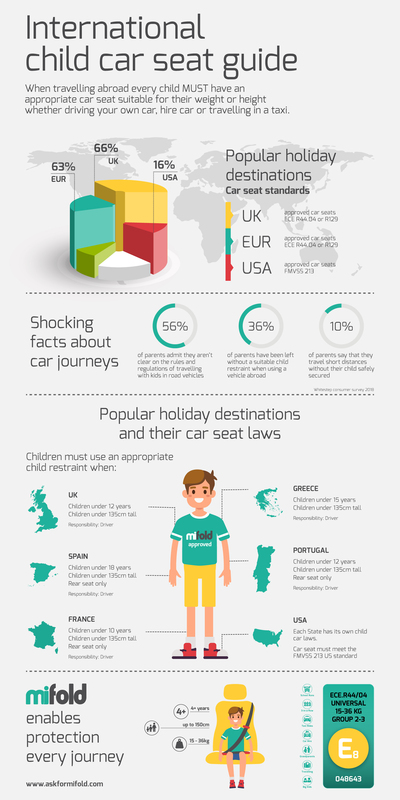 To help families travel safely this summer, mifold has created a guide to car seat safety laws both at home and abroad. It may also be this uncertainty that accounts for the 43 per cent of parents who opt to carry a bulky car seat on the off-chance they might need one. With its advanced and compact design, mifold offers a highly portable car seat for every child, in every car, on every journey, in the UK or abroad. Measuring only 23 x 12 x 2 cm when folded and weighing less than a bottle of water (700g), mifold can adjust to securely restrain children 4 year+, between 15-36kg. A straw poll of 45 parents carried out on Facebook revealed that the most popular items packed in hand luggage for stress-free air travel with little ones includes wipes, snacks, a tablet, books, sweets, a change of clothing, children’s paracetamol and headphones! mifold is available from boots.co.uk, John Lewis, Amazon.co.uk and other selected retailers for £39.95. Visit www.askformifold.com or find us on Facebook @mifoldUK for more information. For more information or supporting imagery contat Georgina Morgan at Vista PR: glm@vistapublicrelations.com or 01295 369 182 / 07835 262 684. Whitestep - www.whitestep.co.uk – is the UK distributor of mifold and is a corporate partner to Brake, the road safety charity. mifold is designed to conform to the most universally accepted global booster car seat regulations worldwide. It has been regularly and rigorously crash tested in facilities around the world, complying successfully with the performance requirements of all the regulations. Jon has a history of developing, launching and growing businesses, categories and brands. Former senior executive at large companies like Unilever and Johnson & Johnson; current inventor, executive coach, speaker, and entrepreneur. Uniquely placed at the interface of traditional and digital business, today Jon works all over the world helping companies embrace technology for growth and success. Jon raised several million pounds via three rounds of fundraising to create mifold and when he looked to pre-sell the seats he turned to crowdfunding and set a target of $40,000 dollars within the first two weeks. He reached this target in less than two hours and went on to pre-sell more than $2.5m in 130 countries worldwide. This press release was distributed by ResponseSource Press Release Wire on behalf of Vista Public Relations in the following categories: Children & Teenagers, Women's Interest & Beauty, Travel, for more information visit https://pressreleasewire.responsesource.com/about.